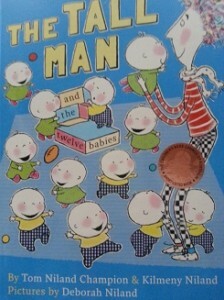 Read ‘The Tall Man and The Twelve Babies’ by Tom Niland Champion and Kilmeny Niland to your child. Enjoy the story and check out the illustrations together. Sometimes as adults we assume things, like your child understanding what ‘first’ means or what ‘end’ means. Today we are going to explore what ‘tall’ means. Using blocks or containers from around your house, find some space and build some ‘tall’ buildings. To have ‘tall’ buildings you will also need to build ‘short’ buildings so your child can see the difference. As you and your child are building say things like, “Can you make that building taller?”. You may also explore other words like ‘long’ and ‘wide’. 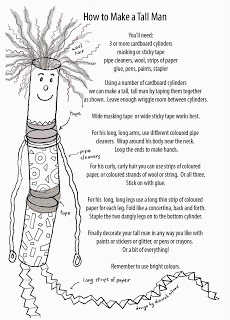 Make Your Own Tall Man – draw a black texta outline of a person and decorate with wool, coloured paper and scraps. How Tall Are You? Lay a large piece of paper and trace around your child. Then measure the height using blocks, pop sticks or one of my favourite things is paper streamers. If you use the streamers, you can hang up the piece you use today then measure your child’s height in a months time. Go around your house or the backyard and find things your child is ‘taller’ than and ‘shorter’ than, as well as ‘the same height’. • Draw and Cut out 12 babies based on the book. Use these to count from 0-12. • Get your child to start counting from other numbers other than 0 – for example count on from 4. • Practise addition – put down 4 babies and add 2, how many altogether? • Practise subtraction – place the 12 babies down and take 1 away – how many are left? 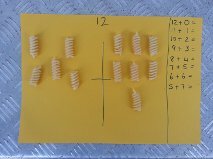 • How many different ways can you make 12? Use the babies or counters to explore this. We used pieces of pasta. See picture. • 12 is a dozen – look at an egg tray.